Office Hours: Monday 8:00 A.M. until 5:00 P.M.
Tuesday - Friday 8:00 A.M. until 4:00 P.M. 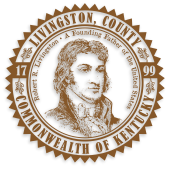 The Livingston Circuit/District Court Clerk's Office performs a variety of duties from maintaining official records to collecting fees, fines, costs, and issuing driver's licenses. Should you need information regarding titles to a vehicle or titling a vehicle, please contact the County Court Clerk's Office by clicking here. Every Tuesday at 9:00 a.m. for civil; domestic violence; small claims; probates and eviction cases. 10:30 a.m. for child support cases; 11:00 a.m. for juvenile cases. 1st Wednesday of each month at 1:00 p.m. for child support cases. 3rd Wednesday of each month at 9:00 a.m. for civil cases; 1:00 p.m. for criminal cases. To request special hearing dates in Circuit Court contact Circuit Judge's Administrative Assistant, Kathy Wallace, at 270.388.5182. 1st, 3rd and 5th Friday's from 8:30 a.m. to 10:30 a.m. for the written test.